Satisfy your camping sweet tooth with this clever and delicious treat. You can do different variations of pudding flavors and even add some sprinkles for fun too. This will easily become a new campfire favorite for the entire family. Take wooden dowel and coat cooking end with oil. Wrap crescent roll around top and about 4″ down dowel. Make sure it’s not too thick and doesn’t have any holes. Cook over hot coals until golden brown, not doughy. Put your favorite flavor of pudding inside. Frost top and add whip cream…oh, so yummy. 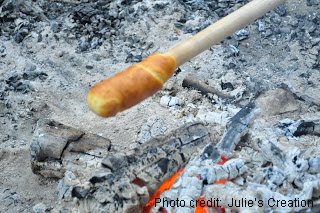 We have been making these for 30 years, we call them pie on a stick, using regular refrigerator biscuits, not the ones with extra fat in them, and we fill with any kind of pie filling we can find, lemon, blueberry, mincemeat, apple, strawberry, only limited by your imagination – they are awesome around the campfire. I’m curious …. I would think they would slide off stick before cooked?